DON MILLS, Canada -- The heroes of the Orange Revolution — the man nearly poisoned to death and the beauty in traditional braids — inspired the world in 2004. 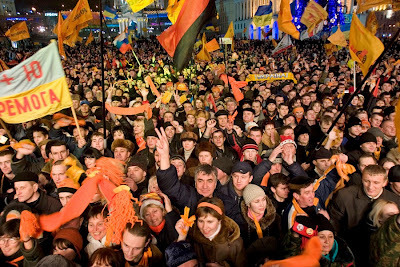 I covered this non-violent protest and stood, with half a million others, many nights in a frigid Kiev square to hear Viktor Yushchenko and Yulia Tymoshenko denounce the country’s corrupt regime. Their grassroots movement overturned the rigged election of Viktor Yanukovych. Yushchenko became President and appointed Tymoshenko to be Prime Minister. Hopes lifted throughout the country, and elsewhere that Ukraine would overthrow their Soviet-style autocrats. But today the country lurches toward bankruptcy and toward becoming a Russian vassal again. Six million have fled and the IMF has cut off credit. Tymoshenko occupies a jail cell in a penal colony, 300 miles east of Kiev, after being sentenced for seven years on trumped up charges. Polling shows that she is Ukraine’s most popular politician. Yushchenko, booed wherever he appears these days, occupies a Presidential palace he designed for himself, paid for by taxpayers, even though he was thrown out as President in 2010. And Yanukovych, whose 2004 election was overturned, won in 2010 after the Orange Revolution’s heroes destroyed one another politically. He and his insiders live like Playboys in a country riven by poverty and corruption. Those of us who followed events there wonder what happened to Eastern Europe’s Arab Spring and to the magical couple who risked everything and inspired a nation of 45 million people and the world. These and other questions were debated and discussed at a conference this week in Ottawa, sponsored by the Ukrainian Canadian Congress. Experts appeared before a Parliamentary committee and before a series of influential plenary sessions to discuss issues around the theme “Ukraine at the Crossroads”. Ukraine and Canada are enmeshed. The largest Ukrainian diaspora lives here, an estimated 1.5 million, and Canada was the first western nation to recognize Ukraine’s independence in 1991. “Canada’s soft power is important in Ukraine and the country must work with the Poles and Americans and target the middle class,” said Danylo Bilak, a Canadian-Ukrainian lawyer who has lived in Kiev for 20 years. That is what Oleh Rybachuk is doing. He worked for both the Orange Revolution’s leaders as Yushchenko’s campaign chair, Chief of Staff and Tymoshenko’s assistant. He is disgusted with them for their actions and devotes his time to developing grassroots organizations, NGOs, throughout the country to restart the Orange movement. “In August 2005, one year after the Orange Revolution, the two were fighting and I tried to broker a deal between them. Each agreed to fire three antagonistic people from their teams, hold a press conference the next day and promise not to oppose one other. It was a truce,” he said. Tymoshenko reneged on the agreement and that night tried to muster support to remove Yushchenko. He found out and it has been war ever since between the two. “I blame them both,” he said. “Politics is cold blooded, not a marriage. If you are seen together like they were they had no right to do this,” he said. In Ukraine, political terms last four years, with Presidential elections alternating every two years with Parliamentary runoffs. The next one is in October and the Ottawa conference attendees intend to muster international support and recruit thousands of observers to insure that the elections are fair. 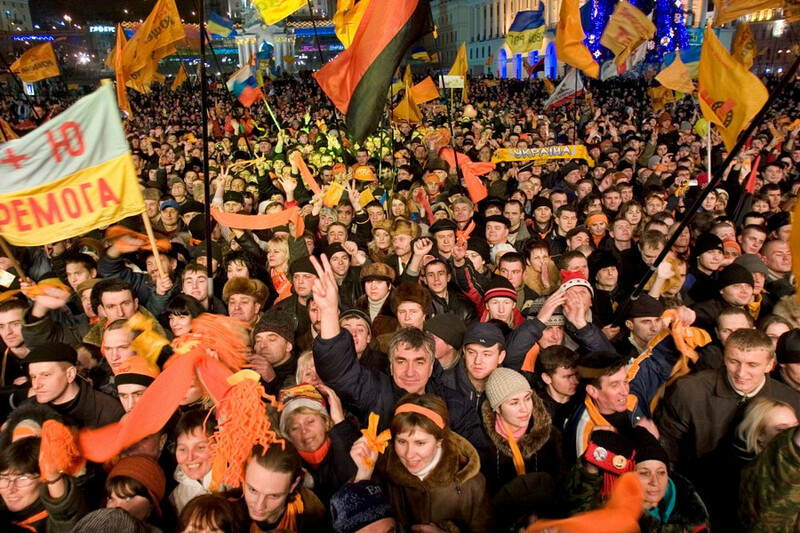 After the Orange Revolution, the Canadian government and Canadian-Ukrainian community sent more observers than any other nation. But even fair elections won’t save the day. The concern is that the country’s opposition parties are so preoccupied fending off the government’s assault on human rights, activism and press freedoms that they have been unable to organize. “In 20 years, how little has changed. Ukraine has had various shades of democrats as leaders and now we have crooks,” said Bilak. The only hope, and one backed by U.S. Secretary of State Hillary Clinton, is to partner with civil society, young people and international organizations. “It’s frustrating,” said Tom Melia, deputy assistant Secretary of State in Washington. What’s important is that Rybachuk, the Orange Revolution insider, and his colleagues are “optimistic”. “People are not afraid. We now have 150 NGOs in all the major cities in our ‘clean up Parliament campaign’ to elect and find better parliamentarians,” he said. “People don’t watch the propaganda in the media. Facebook had 300,000 members a year ago and now has two million."